Tenda India which is known for its networking equipment launched quite a few devices in India. Tenda also showcased some of its products at The Cable TV Show 2019 recently. For the first time, Tenda India has organized a Tenda Campus Recruitment Drive in Delhi. The drive was organized with an aim to leverage the IT industry’s growth by creating new opportunities for India’s young fresh talented youth. 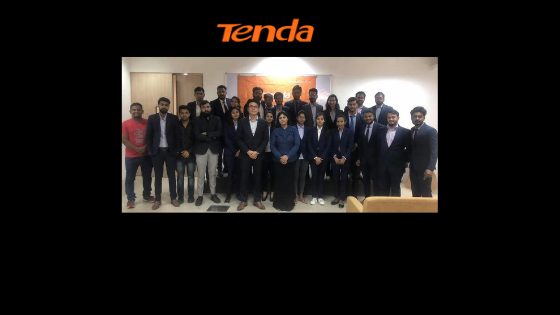 Tenda has targeted two colleges in Delhi namely Bharati Vidyapeeth University and IBMR, Gurgaon as the company was looking for students of MBA with a specialization in Marketing. Bharati Vidyapeeth had its campus recruitment rounds on the 8th March 2019 and IBMR on the 6th March 2019. At Bharati Vidyapeeth University, a total of seven students went through 2 rounds of interviews and one of them was selected, whereas, at IBMR, 21 students went through 2 rounds of Interview. It was followed by the presentation by Mr. John, Director, Tenda India, and Ms. Hina Jain, HR Manager, Tenda India, at both the colleges. With more and more cities working towards becoming Smart Cities, Tenda plans to pick up the pace. With the help of such recruitment drives, Tenda intends to hire the best so that it can offer the best in return. In the near future, Tenda has plans for more such recruitment drives to create job opportunities for the upcoming youth of India. Founded in 1999, Tenda technology is the recognized leading supplier of networking devices and equipment. Tenda has two R&D centers, Shenzhen and Chengdu, with about 1000 employees; one Manufacture center, with about 3000 members and a new 120000 m2 manufacture base under construction. Tenda products include home networking, business networking, switch, broadband CPE, gateway, powerlines, mobile broadband, IP camera etc.